Pat Fenlon was a bemused figure after his Hibernian team lost to a late Colin McMenamin goal for Ross County in a five-goal cracker in Dingwall. "We're bitterly disappointed. I thought we did enough to win the game, never mind lose it," said the Hibs manager. "In the second half, particularly, I thought we played really well and created a lot of chances. "I'm still scratching my head how we lost. We've given away sloppy goals again and that is disappointing." Leigh Griffiths put the Leith men ahead but Stuart Kettlewell and Iain Vigurs gave County a 2-1 lead before a James McPake volley levelled the score before half-time. 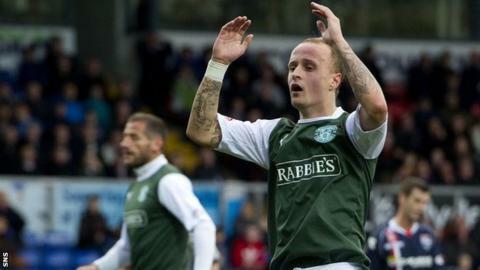 Striker Griffiths went close as Hibs strived to gain the three points that would keep them within touching distance of Scottish Premier League leaders Celtic. But they were stung by McMenamin's decisive third for Derek Adams' side. "Leigh had two or three chances in the second half and he hit a couple of them really well and on another day they might have gone in," lamented Fenlon. "We know we've got to be better as a team when we're defending, that's for certain. "We gave away too many free-kicks today. Ross County got good delivery [into the box], they have a lot of big players. "It's a set-back. We have to deal with it and move on. It's how you deal with disappointments like we've had today."